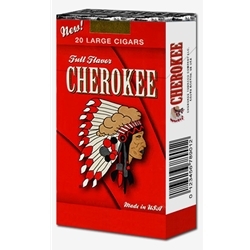 Cherokee Filtered Cigars are a medium bodied smoke veneered in a homogenized tobacco leaf wrapper, this little cigar has perfectly hidden blends of the ripened Green River and the powerful Black Cavendish tobaccos that packs a punch by delivering a medium to full bodied smoke. These discount filtered cigars are available in Full Flavor 20 pack cartons. Cherokee Filtered Cigars are distributed nationwide by Firebird Manufacturing, LLC located in South Boston, VA.
Every day smokers are trading in their expensive retail brands and choosing filtered little cigars instead. A great way to save money in an over-priced world. Here at Smokers Discounts we believe you should too! We’ve made it easy and affordable to buy cigars online. Call us for more details!